From the attic bedroom window in my Rochester home, deep deep in the night, you could hear the sound of a train. The (unwelcome but necessary) woosh of the two nearby highways. Then, every once in a while, an eerie sound could be heard: Whoo Whoo Hooooooo…. It was the Barred Owl who lived in a grove of woods up at the Cobbs Hill Reservoir. Since moving to our development in suburban Detroit, things are a lot more quiet. I miss the sound of the trains. I don’t miss the woosh of the highway. But, and this is strange, because we live in a more wooded suburban area, I no longer hear any owls. And I miss that late-night hoot of that Barred owl very, very much. 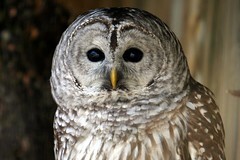 Chouette rayée / Barred Owl (Photo credit: meantux)night Barred Owl hoot very much. I’m not much of a birder. I leave that hobby up to my husband. He even has a life list. I like to hike. And if I hear a bird, I think, fantastic, what a beautiful song that bird has, now let’s move on. I don’t like standing in one place for too long for the sake of identifying or calling to a bird. But, then again, those owls have a soft spot with me. So, the other morning, as I drowsily heard the report that the Michigan Department of Natural Resources would be hosting “Owl Prowl” evenings all over the state,I did some further investigation and found the one happening closest to our house. Turns out it took place last Sunday night at Bald Mountain State Recreation Area in Auburn Hills. The free event attracted about 125 people of all ages for a talk, some s’mores by a campfire, and the hope of sighting some owls. Around the campfire, our guides, members of the Audobon Society, explained the order of calling the owls. It turns out that the larger owls tend to eat the smaller screech owls. So, the screech owls would be called first, then the larger owls in a different part of the forest. If the larger owls were called first, the smaller ones would make themselves scarce. Another thing that scares away owls, and other wildlife, are humans. The guides advised us to be as quiet as possible. We were a big group. As I explained earlier, about 150 owl enthusiasts had come out that freezing night, with temperatures in the teens, to sight some owls. Those were 100 plus pairs of boots stomping in the snow. Children’s snow pants swish swished as they walked. Yet, when we were deep enough in the woods and the bird guides released their calls, it was quiet enough to hear the snow falling on our parkas. In the end, a screech-owl and a Barred Owl called back to us. We didn’t see any owls, but just hearing them call back to our calls in the night was enough. And, it was time spent in the cold refreshing winter air. If you live in Michigan and want to find an Owl Prowl near you, check out this site, and tell me what you saw and heard. Barred Owl finds a winter respite. Literally, it was VERY cool.